From the kitchen of One Perfect Bite...It's been years since I made macaroons. My original recipe called for sweetened condensed milk and I thought the cookies made with it were cloyingly sweet. Despite that, I made the cookies each Christmas for Bob's dad who really loved them. When we lost Andy, macaroons, and his favorite chocolate covered cherries, were dropped from my Christmas baking list. I was browsing through the Joy of Baking website the other day when I happened on the recipe I'm featuring today. It is substantially different from the one I had used in the past. I had coconut in the pantry, so I decided to give this version a try. I'm glad I did. While the cookies are way too sweet for my taste, Bob and one of our neighbors loved them. The cookies are very easy to make and the only problem I had was getting them to brown in the time suggested by the recipe. My cookies were still pale at the 20 minute mark and I had to bake them for an additional 10 minutes to get some color. I also suggest adding a small amount of almond extract to the cookie dough. If you have a sweet tooth I think you'll love this recipe. The cake flour gives the cookies a texture that is quite different from that of the usual macaroon and they are slightly less sweet. Here's the recipe. 1) Combine egg whites, sugar and salt in top of a double boiler set over simmering water. Whisk until mixture feels warm and is creamy. Stir in vanilla and almond extract and then add coconut and cake flour. Mix well. Cover and refrigerate for about two hours, or until firm. 2) Preheat oven to 325 degrees F and line two baking sheets with parchment paper. 3) Place small mounds (heaping tablespoons) of batter on parchment-lined baking sheet, spacing several inches apart. Bake for about 20 to 30 minutes, or until golden brown. Remove from oven and let cool on baking sheet for about 10 minutes. Transfer to a wire rack to cool completely. Yield: 2 dozen macaroons. I adore coconut. I was going to make coconut cookies yesterday and to my horror I didn't have any coconut! Next grocery trip coconut and I'm thinking some coconut macaroons. Hubby really likes this delicate coconut cookies..will keep your recipe in mind when I make these! Macaroons always look so pretty. Buying Christmas gifts the other day, I was getting some small fancy soaps for people, and they had coconut soap! It smelled so good, too, so I bought some! One of your little pictures below shows flowerpot bread. We went to a restaraunt a coule times called The spinnaker, and everyone who sat down at a table got a flowerpot bread, it was so good! Macaroons has always been on my list of "new bakes to try"! But somehow or other, I never did! Your coconut macaroons looks delightful. Thanks for reminding me! Have a lovely day! this looks great, I am sure I will love it. My dad and I are the only two in the family to like coconut macaroons. Maybe I can surprise him with a batch when I fly home for Christmas. I imagine that these keep fairly well. Thank you for sharing this with me. I hope you have a joyful week, my friend! Coconut macaroons sure are sweet--but I love them! Using almond extract is a great idea. I'm wondering what using almond flour in replacement of part of the cake flour would do. I just wanted to say that these are my husband's favorites! Love those cute peaks of coconut macaroons. Lovely click. They look like three kisses. Wonder if it is macaroon season? Yours looks really good. 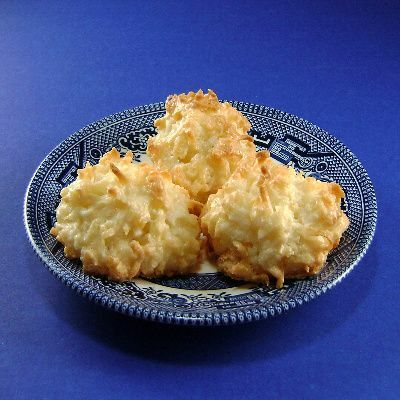 Coconut macaroons are an old favorite of mine. Time to make some this season. Yours have a soft look. Is it perhaps the cake flour? I'll follow your recipe to get the same effect. Thanks for the recipe! Blessings to you too these holidays! you dcall them Maroons? That world means some kind of pasta in swedish ;) I used to bake these, but when the kids moved away I got lazy. And...I can´t eat it all by myself. Wow.. looks so yummy. Love coconut. LOVE macaroons, my favorite! These look wonderful, thanks! Macaroons are one of my favourite holiday cookies dipped in chocolate. You are more than right when you say they are sweet but then that prevents you from eating an entire plate of them...maybe...wink. I love coconut, I will try these this weekend! I saw a lady sitting outside (well actually inside the mall) of Godiva on Saturday munching on one of their chocolate-covered macaroons. It was all I could do to not go in and purchase one for myself because they come with bittersweet dark chocolate that cuts the sweetness. I didn't and have thought about them ever since. I've never actually had macaroons! Sounds yummy! Even if they are sweet, I'm sure they are great! Anyway, we all have sweet tooth people around us! Have a nice day! I love the moist chewiness of macaroons but, like you, hate the cloying sweetness that some of them have. Coconut is sweet enough! These sound absolutely fantastic! Your macaroons look fantastic! Haven't made these in years and they are my husband's favourite. I think I will try my hand at these again; thank you. My husband would love these because he is a big fan of coconut. Your macaroons look fabulous! I love macaroons! I love coconut anything... especially macaroons. They look lovely Mary. Scrumptious macaroons, i dont bother to grab some.. I love macaroons. Yours look perfect. I have never made my own, but I think I should attempt to soon after looking at these! I'm also NOT a fan of crazy sweet cookies so these to me definitely sound better than the original. Isn't it funny how many cookies get added to the list (and stay there) because one person likes them. coconut is an ingredient i never get sick up. these are just lovely, they sound wonderful! Hi Mary, that looks really tempting. I have passed an award on to you. Please know that you touch the lives of many and we appreciate you. You will find it on the award page. Just wanted to let you know that your blog is wonderful and you are sincerely appreciated. These do look wonderful - I haven't baked with coconut in years because daughter hates it - but I should give it a go again because the rest of us love it! Your Coconut Macaroons are really lovely, Mary. This is my hubby's favorite Christmas cookie and I still have to make it for him this year. I think I may try your recipe, it looks wonderful! I've never made macaroons..this post reminds me that I definitely need to put it on my list for this years baking agenda! if you love coconut, i found a brilliantly simple idea the other day: just sprinkle the tiniest bit on your standard chocolate chip cookie recipe. too simple! Best to you and yours this holiday. Cheers! Glad you tried this recipe for us Mary. I do love coconut treats like this one. They would probably be too sweet for me too, I'm sure. I love dessert...but too sweet turns me off. Your candid opinion is always tremendously appreciated. Hmmmmmm.I got to try these. Te invito a que hagas la receta de las sultanas de coco que hacemos en nuestro pais, y que luego me cuentes si te han gustado o no. Sin duda, haré alguna para mi familia. seguiré paseando por tu blog. ¡Me encanta¡.